My Zhime ("My Otome Hime") is the alternate-universe sequel to My Hime. The sequel outdoes the original. 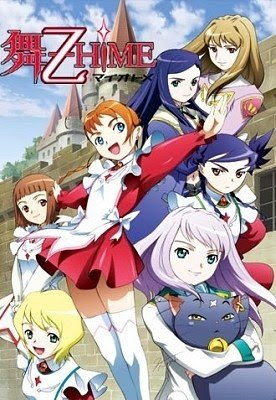 It's not as cinematically polished as its predecessor, and compared to the gloomy angst that My Hime wallows in from the start, takes itself much less seriously (at first). This could tempt the viewer to take it less seriously as well. Yet it is, in premise and execution, the more substantive of the two series. In fact, My Zhime is (unwittingly) one of the more important contributions to the superhero genre in a long time. My Hime takes place in the here and now at a private high school that turns out to house a secret academy for supergirls, who each manifest her powers through a unique mecha "child" (magnificently rendered in CGI). Both a Voldemort and a Lex Luther show up as protagonists during the series, along with the plot device from Highlander: "There shall be only one!" And it all works quite well as long as you don't stop to think about it too hard. But once disbelief ceases to suspend itself, things begin to sag into that same Earth-in-the-balance rut. The same problem attends any superhero story that relies on a mad scientist/wizard/capitalist-with-utopian-Stalinist-inclinations to generate conflict. Like Smallville and Harry Potter, great dollops of teenage angst are served up to tide over the increasingly untenable bouts with the mad-scientist/wizard/capitalist-with-utopian-Stalinist-inclinations. Good writing can make it work, as in Spider-Man. Or, as in Smallville, it can just make Lex Luther and his gang more interesting than Clark Kent (as Tolstoy might have put it: "All happy families are alike; but the Luther family is unhappy in its own, hugely entertaining way"). But ultimately, as in My Hime and Harry Potter and X-Men and Lord of the Rings, it's the mad-scientist/wizard/capitalist-with-utopian-Stalinist-inclinations plot device that hobbles the whole enterprise. Because A) there can't be that many of them; and B) they don't act like that anyway. My Zhime takes all the characters from My Hime and transports them across space and time to (literally) another planet. (For no other reason except artistic recycling, I guess--why let perfectly good characters go to waste?) It dumps a fair amount of the angst, along with the mad-scientist/wizard/capitalist-with-utopian-Stalinist-inclinations. Instead, it tries something different: sophisticated geopolitics and clever Machiavellian scheming. Though packaged so cutely it might not be apparent at first. The story is content to let the real machinations sneak up on you. My Zhime begins with Arika Yumemiya traveling to Windbloom, searching for information about her mother, who was an Otome (the "Z" character is actually the first kanji in "otome," meaning "young woman" or "virgin"). Otome are graduates of the Garderobe Academy. The Academy matriculates girls who possess latent superpower abilities (echoes of Harry Potter and X-Men). Upon graduating, the Otome become National Security Advisors to heads of state (usually of their home countries), like Condoleezza Rice with Wonder Woman resources at her fingertips. The relationship between the Otome and the head of state is ritualistic and contractual. Raising the stakes, in what would seem a nod to The Twelve Kingdoms, the Otome and head of state live or die together. That is, if the Otome is killed in conflict, so does her contract holder. Essentially, the Otome serve as the nuclear deterrence in the high-stakes international relations game. Of course, there's always the possibility that a head of state will attempt a high-risk venture nonetheless, pitting his Otome against others. When this is pointed out to her, Arika objects in typical why-can't-we-all-just-get-along terms. "Welcome to the real world," she's told in turn. And what a welcome relief that is, the real world certainly missing from Harry Potter, for one (though present in Jonathan Strange & Mr. Norrell). There doesn't have to be a "Big Bad" (as Buffy phrased is). Normal human conflict is more than enough to generate cinematic drama. Frank Miller accomplishes this in The Dark Knight Returns, when he pits Batman against Superman, not in a contest of good vs. evil, but in a clash of personality and policy differences (and the fact that Superman's smug chops needed some busting). In the real world, conflicts in temperament combined with conflicts in geopolitical intent can have major international repercussions. No James Bondian need to concoct one power-crazed supervillain (or as in Bourne Identity or Enemy of the State, one power-crazed--and unbelievably efficient--government agency) after the next. To be sure, season one takes too many opportunities to take the low road. Season two sobers up considerably and grows quite dark. But it works well because you realize that during the silliness of season one, all the necessary elements were put in place. No deus ex machina required. That's the impressive thing about the premise of My Zhime: it can handle it. My Zhime recycled the characters from My Hime and took things up a notch. Now somebody needs to recycle this premise and take things even further. UPDATE: the conclusion of the series discussed here.